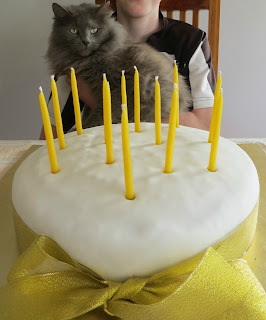 As of the end of last month, we have a teenager in the family! Just quite how our little boy turned into a young man is beyond us, but like every twist and turn of life, we just have to accept and enjoy it. And there's nothing not to enjoy - apart from the guitar amp, that is. candles. They smelt like honey and glowed like gold. food, and the ribbon came from the $2 shop. Eeek. Earlier this year, just as we were wondering how to keep him from falling into the irresistible well of screens and gaming, along came music and swept him away. He'd been listening to his own music for a long time, and making it on the violin until about a year ago. The violin, however, was limited to practices and lessons. It sounded good, but was never played for sheer joy. Then a dear friend, at the end of a hot mosquito-ridden barbeque evening last autumn, brought out her ukulele and began to play and sing. The floodgates opened, the very point of music was offered up on a deliciously greasy platter, and in the days and weeks following we suddenly had a young maestro on the previously dusty ukulele, and shortly afterwards on his dad's guitar. Being middle class suckers for beautiful blue eyes and a good voice, we bought him his own guitar and in May started forking out for lessons. Tomorrow night he is even playing a couple of songs at a pub with his teacher! This honour comes after many, many hours of practice, of course - none of which actually felt like what violin practice used to, I'm sure. It was pure pleasure. But it's at home that the point of it all, and the joy of it all, comes together. Almost every night (no TV, you see), father and son play together, choosing songs and practicing, perfecting. To us that feels exactly how a harmonious home with a 13-year-old should. The pile on the coffee table is not the focal point of this photo. The flash new guitar can be plugged into an amp, and the longed-for amp arrived here as a present from Grandma, Uncle and Aunt on the thirteenth birthday. We have an old electric guitar, too, that now gets a daily workout. Oh for a power cut. Oh dear. It became immediately clear that I am an 'unplugged', acoustic guitar kind of person. I admit to banning the amp from the lounge (I know, what happened to family harmony), so he shuts himself and all that distortion up in his bedroom. And with that noise, both us and the neighbours REALLY know we have a teenager in the house. I often write on this blog about seasons: the garden, the flowers, the frosts, the cold, the heat. I enjoy the good bits of them, but there's always a little part of me looking forward to going back. In winter I look forward to the return of warmer days, sunshine and blossom, and in sweaty February I am pleased that cooler autumn days will be back soon. The phases of our children's lives are like seasons. But unlike the outdoor seasons, the darling baby, the blue-eyed kindy boy overflowing with delight at the discovery of dinosaurs, won't ever return. I can't have him back. If I could swing a little time travel, that is exactly where I'd go for a visit, but I can't. The only way out of the sadness of that truth is to love and enjoy him now as much as possible.